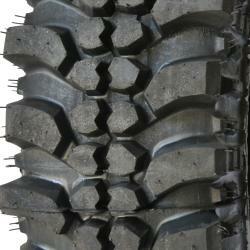 Off-road tyre designed for the toughest tasks. This type of tires is mainly for sport cars and enthusiasts, for whom driving on black is just a must. Deep protruding blocks and long distances make that, very nicely to clean in the field muddy but also causes noise on asphalt. I suggest you buy this model if the use of the car on the ground exceeds 90%.